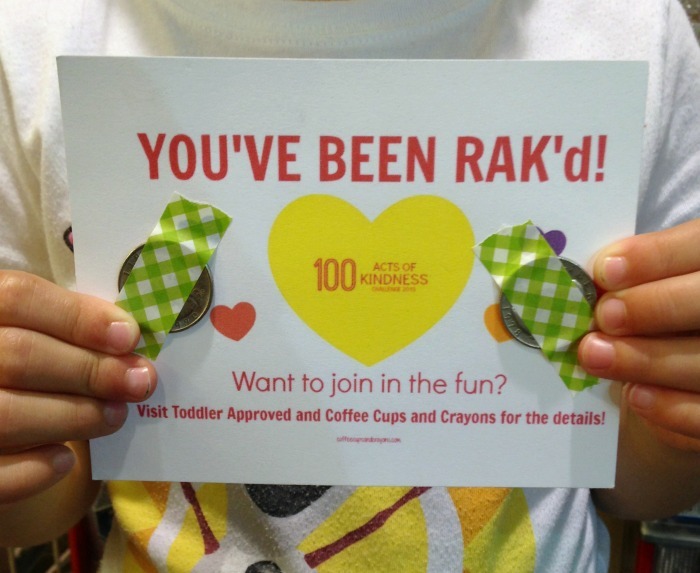 We have been having so much fun with the 100 Acts of Kindness Challenge! The goal is simple. Just do 100 acts of kindness by Valentines’s Day with your family or class and get ready for it to change the dynamic of your day! Kristina from Toddler Approved and I are here to support you every step of the way. We have a kindness newsletter you can subscribe to and fun challenges you can do. My kids loved Kristina’s Week #1 Kindness Challenge and we cannot wait to share challenge #2 with you! 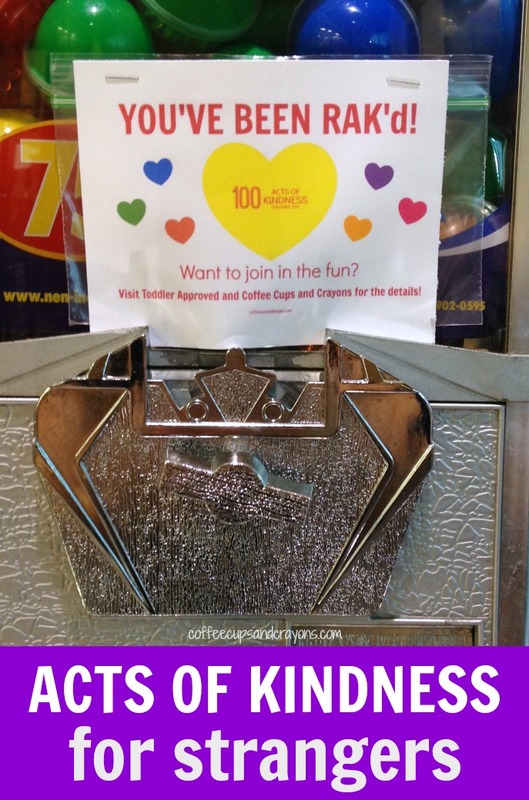 Our Week #2 Kindness Challenge is to leave change in a vending machine for a stranger! This one is a blast! My kids always say they feel like secret kindness ninjas when we sneak in and leave money for someone to find. 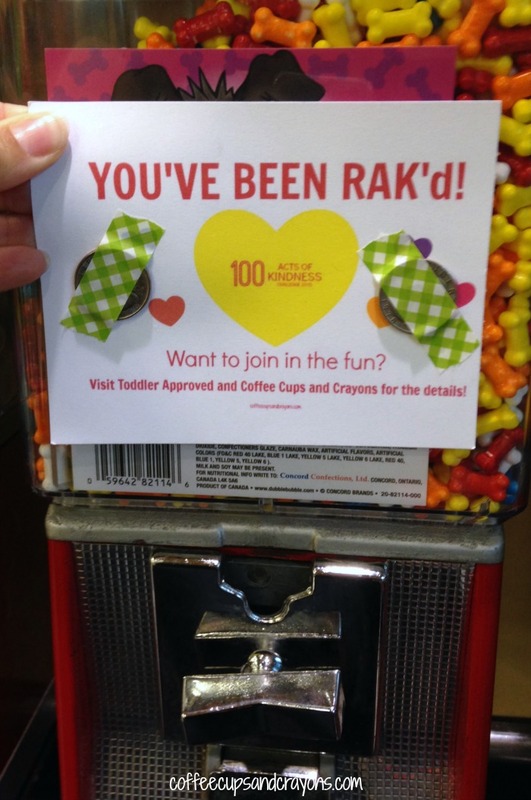 I made some free printable RAK’d cards for you to print out and use for the challenge if you want. There are 4 cards on the sheet so all you need to do is print and cut. We taped quarters to the front of some and stuck them in the front of the machines that were $0.25 and $0.50. We also filled some bags with $0.75 and $1 and stapled the cards to the front for more expensive vending machines. Doing acts of kindness with your kids has so many benefits. Kids learn about compassion and empathy and start to develop a sense of responsibility for their world. Doing good for others and making a difference, no matter how small, is empowering. It helps kids gain confidence and develop self-esteem. Making kindness habitual and automatic changes your outlook on life no matter what your age is and that kind of happiness cannot be overstated. Ready to go spread some kindness? 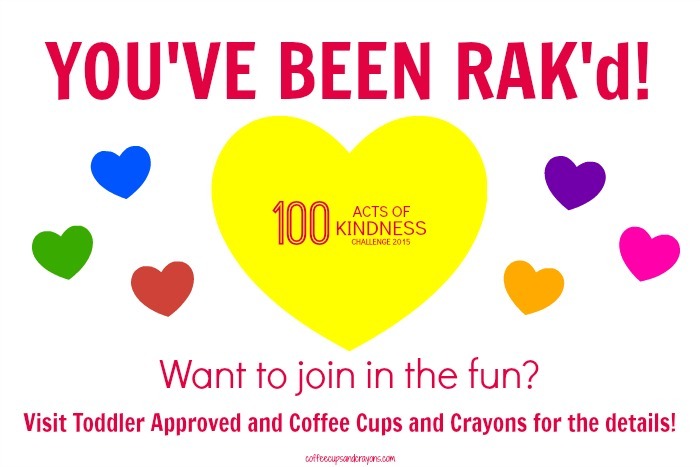 Make sure to share a photo with us on Facebook and tag your Instagram photos with #100actsofkindness so we can cheer you on! I love this! I’m always trying to think of new ways to show my boys how to be kind without expecting anything in return. These are great ideas!